We love to have people over for dinner even during the week but it can be difficult to get home from work and have things prepared without feeling like it’s more of a hassle than it’s worth. Today, I’ve got a super easy recipe to share with you that’s tasty and beautiful when plated – great for a dinner party when you want to serve something that looks impressive and tastes great but without major headaches. Warmer weather is upon us here in Alabama and I’m craving light and healthy meals – particularly any seafood I can get my hands on. G & I recently took a quick road trip to Peach Park in Clanton, AL and I picked up some delicious Spicy Peach Grilling Sauce which served as the marinade for this dish. 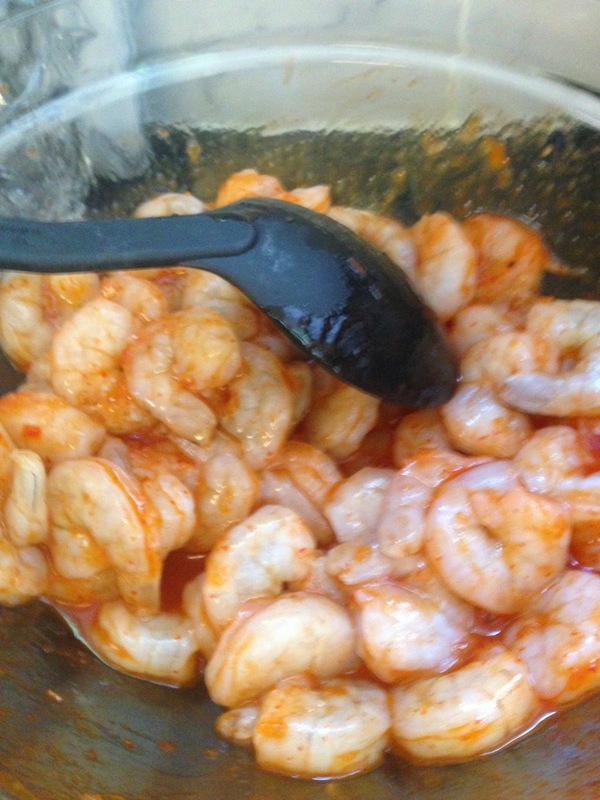 First, place peeled and deveined shrimp in bowl with marinade/sauce. Shrimp isn’t really something you would marinate overnight, so I do this just about 45 minutes before I’m planning to serve just to give it a little kick. If your marinate too long, your shrimp will be mushy and gross. You’ll use the sauce later as well. Salt & pepper to taste. Second, slice your cabbage into round discs (horizontally). Place on baking sheet and brush with olive oil. Season with salt, pepper and garlic to taste. Since the main element of this meal – shrimp – isn’t super flavorful on it’s own, I suggest going heaving on the seasoning. 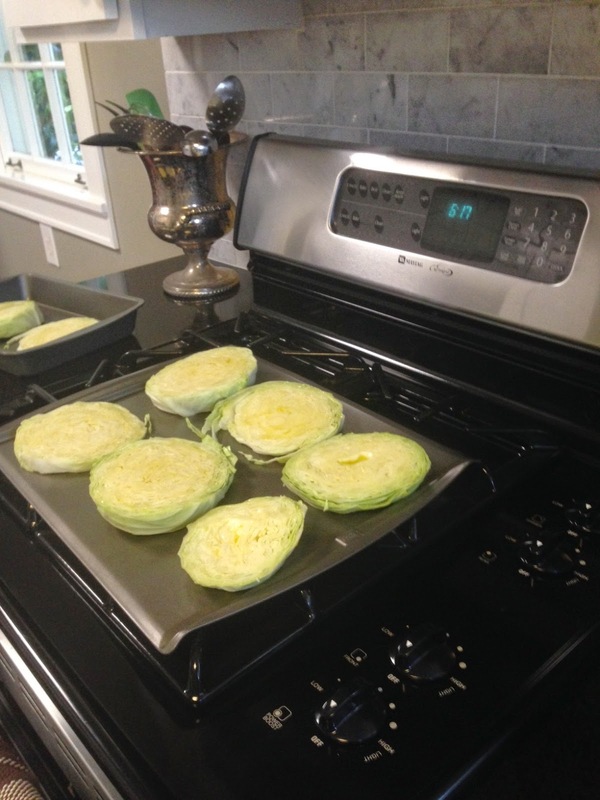 Roast the cabbage in the oven on 400 for about 15 minutes. That’s about how long it will take you to do the rest of steps. 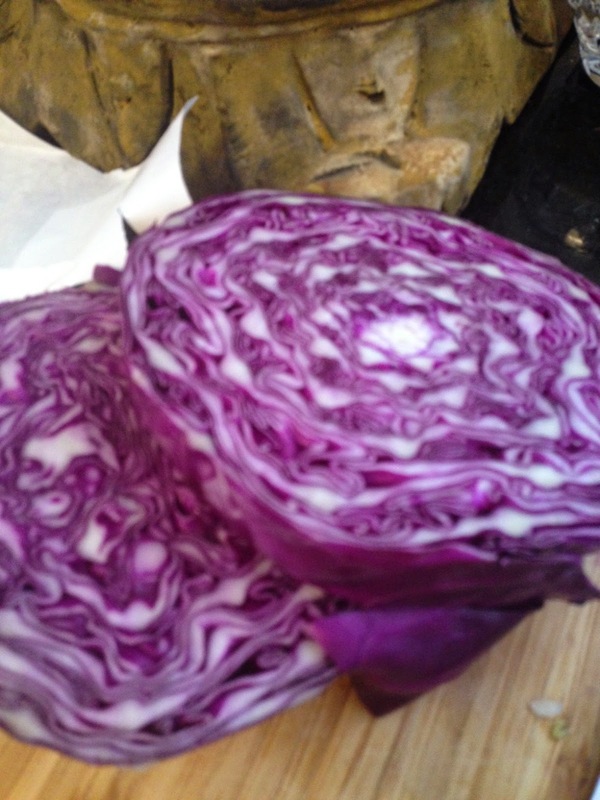 Next, chop your red cabbage. Easy enough, right? Now, cook the shrimp with sauce in pan on medium-high heat until pink. Throw in the chopped red cabbage toward the end. Add a little extra sauce and if it’s looking thin, sift a little cornstarch or flour to thicken it up. While this is going on, pop a few strips of bacon (just enough to add some crumbles on top) in the microwave (I’m not a fan of microwaved bacon typically, but for the purposes of crumbling, it’s just too easy). By the time you’ve done all this, your cabbage steaks should be ready. I like to get mine a little blackened on the edges and top. It pulls out more flavor. Now you just have to assemble – basically, like a pizza. The cabbage steaks are your crust, everything else serves as the topping. Spoon the shrimp/sauce/red cabbage mixture on top. Sprinkle with crumbled goat cheese & bacon and you’re done! Easy, yummy, pretty and the best part – HEALTHY! 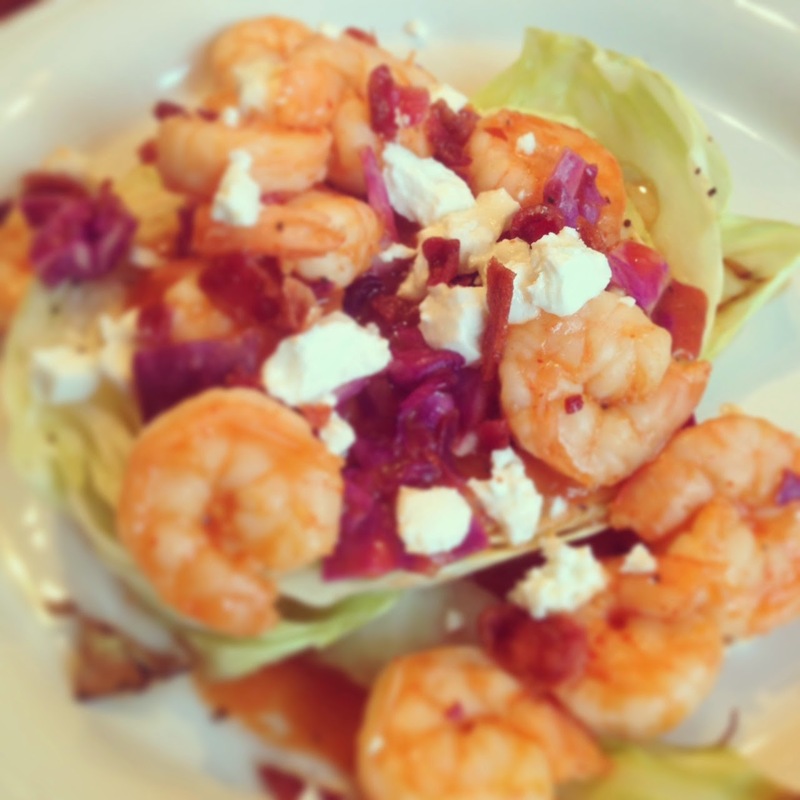 Between the low calorie shrimp and cabbage, the only major calories items in this dish are the bacon and goat cheese which are used in small quantities. Because you can pre-slice and chop your cabbage, the time this requires you to be in the kitchen away from your guests is minimal. Hope you enjoy! If you cook this, comment & let me know what you think. I’ve never posted recipes here before but if I get good feedback, I’ll post them more often!